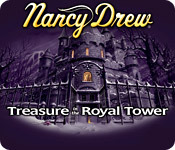 Free Nancy Drew: Treasure in a Royal Tower download for PC - Full Demo or Buy it now at PopGamers.com! Join legendary detective, Nancy Drew, as she follows ancient clues to find the mysterious Wickford Castle`s legendary secret in this Large File Adventure game! The castle is a riddle, full of dead-ends and detours that hint at a legend left behind by Marie Antoinette! Solve baffling puzzles, search concealed rooms, interview evasive suspects, and sidestep danger on the hunt for a secret that the doomed Queen was desperate to hide, in Nancy Drew: Treasure in a Royal Tower!